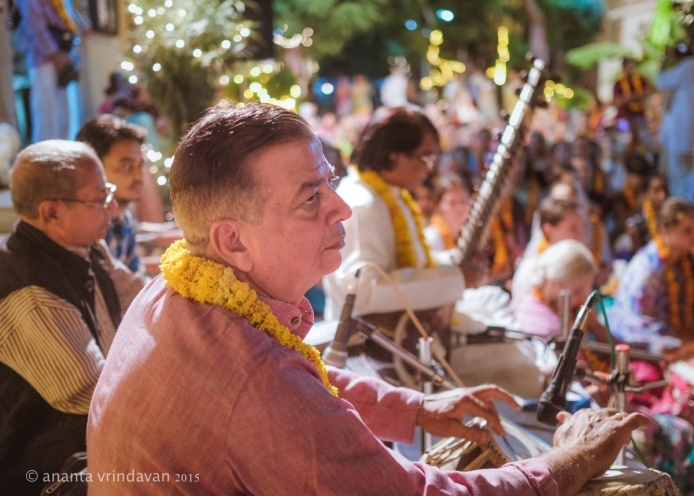 As we mention every year, this has become a great tradition in our Parikramā party which visits Jaipur from Śrī Vṛndāvan Dhām during the month of Kārtik, to comes here and associate with the Mangalam family and have nice Kīrtana, Kṛṣṇa Kathā and prasad. We would like to thank all the members & extended members of the Mangalam Family; in particular, Kṛṣṇaji, Omji & Śyāmaji. Rājiva wouldn’t let me mention his name so I won’t. (Laughs) I got away with that one somehow or other. But thank you, all of you, for giving us this opportunity to come and have your association and have a wonderful program here at the factory where you produce so many amazing objects. I know that our devotees, look forward to coming to Jaipur in particular to see our beloved Deities Śrī-Śrī Rādhā–Govinda. 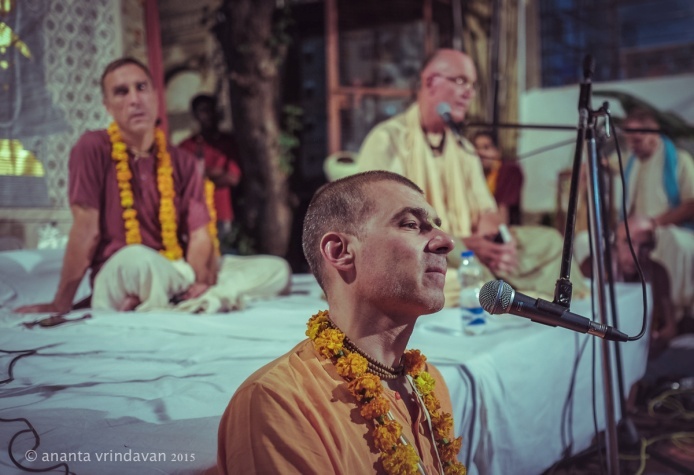 We actually always come here for the Saṅga, for the association because we’re so impressed and so touched with the devotion, the Bhakti, that the people of this city have for these wonderful Deities of Rādhā Govinda-deva. As they are very dear to the people of Jaipur, they are now very dear to people all over the world by the mercy of our spiritual master Śrīla Prabhupāda, who spread this Saṅkīrtan movement practically speaking to every town and village in the planet. Actually every living entity has an eternal relationship with Govindaji; that they have simply forgotten. George Harrison, one of the famous members of the Beatles, once said, “Everyone is a devotee of Kṛṣṇa. Some know it and some don’t”. Actually that relationship can never be broken. It can be forgotten but it cannot be broken. Just like you have your father and your mother, in this life-time, they’re always your father and mother. That relationship can’t be broken. You can make a mistake and turn away from your family but the relationship is always there. There’s a few souls in this world who come to the point of realizing that the point of life is to reestablish our lost relationship with God and they do their best to do so. The word religion as we were mentioning this morning comes from the Latin word “reglio” which means to reconnect with God. Just like the Sanskrit word “yoga” means to yoke—to reconnect also with the Absolute Truth, with Bhagavān, with Kṛṣṇa. Only when that relationship with Kṛṣṇa, that relationship with God is reestablished, can we actually be happy. I was watching the mother and her little baby, so the baby was very happy in the mother’s arms but she wanted to experiment, so she came here and she went here, but as soon as she came back in her mother’s arms she fell asleep, she was very happy. As soon as we reconnect with Kṛṣṇa through the via medium of His Holy Name; of which He is non-different then we see that we become happy, we smile, we laugh, we stand up, we dance because we’re reconnected with our beloved Lord. I sometimes think almost as an analogy that our situation is very similar; we are in this world and we have so much facility for sense gratification, so much facility for material enjoyment but we’re not really happy. At best we can only pretend that we’re happy. Because along with all the material assets come so many complications. You have to maintain them, you have to protect them and you don’t have time to enjoy them. (Laughs). We thank Kṛṣṇaji, Omji, Shyamji and Rajeevji for giving us this opportunity to come together in such an amazing exotic beautiful atmosphere every Kārtik, and together with the family and the friends and the employees, we all sing together the sweet names of the Lord and remember the lotus feet of our Iṣṭadeva, Govindaji.